The following material is accurate but very heavy going. It is normally encountered during a full semester course on either gait or basic functional biomechanics. In order to understand specific lower extremity problems encountered in running, it is important to be aware of the relationship between lower extremity biomechanical abnormalities and specific lower extremity problems. Immediately following is a review of the gait cycle, starting simply and then proceeding to a more complex coverage of foot and lower extremity biomechanics. Then we will review an outline of a general approach to the lower extremity examination, as it pertains to mechanically caused foot and leg problems. Many specific foot problems are caused by biomechanical faults within the foot or lower extremity. In order to understand the cause of these problems, one must understand the normal anatomy, function and biomechanics of the lower extremity. It is important to be able to visualize the events of the normal gait cycle during walking or running. The gait cycle can be divided into different phases and subphases, so that each action of the foot and leg can be evaluated at specific sequential time periods. Before discussing the specifics of gait lets take a quick look at the bones involved. The key boney structures are the talus (2) and calcaneus (1), located at the ankle. The three part joint formed by these two bones is called the subtalar joint. 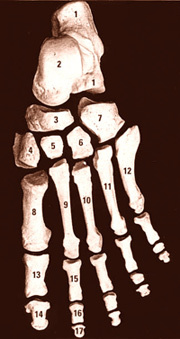 Other key bones include the navicular (3)and cuboid (7), located just anterior to these bones. The two individual joints formed by the talus and navicular and the calcaneus and cuboid make up what is known as the mid-tarsal joint. The leg bones of significance include the femur which is the thigh bone and the tibia which is the larger of the two lower leg bones. The fibula is the smaller leg bone. In front of the tibia is the patella or knee cap. We will not review the anatomy in detail. The gait cycle of each leg is divided into the stance phase and the swing phase. The stance phase is the period of time during which the foot is in contact with the ground. The swing phase is the period of time in which the foot is off the ground and swinging forward. In walking, the stance phase comprises approximately 60% of the gait cycle and the swing phase about 40%. The proportion of swing to stance phase changes as the speed of walking or running increases. As the speed is increased the percentage of time spent in the stance phase decreases. Increased time is then spent in the swing phase and there is an increase in the importance of swing phase muscles. An important point to note is that in running an added subphase is present. Float phase. During float phase, neither foot is on the ground. The difference in time spent in the stance phase of running to walking is 60% of the complete gait cycle is spent in stance phase while walking and only 40% of the time is spent in stance phase during running. The time period during which the forces are applied is also dramatically different between running and walking. A walker moving at a comfortable speed of 120 steps per minute has a total cycle time of 1 second. A runner moving at 12 miles per hour has a cycle time of 0.6 second. However, the stance phase has decreased from .62 second to 0.2 seconds. The stance phase can further be subdivided into its three component phases. The first portion of the stance phase is contact. This phase begins with with the contact of the heel to the ground. This phase is completed when the remainder of the foot touches the ground. During this portion of the stance phase the foot is pronating at the subtalar joint. The leg is internally rotating and the foot is absorbing shock and functioning as a mobile adaptor to the ground surface. The next portion of the stance phase is called midstance. Midstance Phase begins when the entire foot has contacted the ground. The body weight is passing over the foot as the tibia and the rest of the body are moving forward. The opposite leg is off the ground and the foot, in this phase, is bearing body weight alone. During this portion of the stance phase the leg is externally rotating and the foot is supinating at the subtalar joint. It is undergoing a change from being a mobile adaptor to becoming a rigid lever in order to propel the body forward during the final portion of the stance phase - Propulsion. Propulsion begins after heel off and ends with toe off. This phase constitutes the final 35% of stance phase. The body is propelled forward during this phase as weight is shifted to the opposite foot as it makes ground contact. The subtalar joint must be in a supinated position in order for this phase to be normal and efficient. If abnormal pronation is occurring, the midstance phase and this phase will probably be prolonged and weight transfer through the forefoot will not be normal. The swing phase begins immediately after toe off. The first portion of the swing phase is the forward swing which occurs as the foot is being carried forward. The knee is flexed and the foot is dorsiflexed at this time. The next segment of the swing phase is foot descent as the foot is being positioned in preparation for weight bearing and the muscles are stabilizing the body to absorb the shock of heel contact. At heel contact the swing phase ends and a new gait cycle begins. In normal walking, the foot initially contacts at the heel. Usually, the initial contact is postereo-lateral which results in postereo-lateral heel wear. The major determinant of where maximum heel wear occurs is the initial point of contact as determined by the transverse plane position of the foot at the time of contact. Medial heel wear is usually an indication of intoeing gait, and usually points to rotational abnormality in the limb above. In gait of much faster speeds there may be no initial heel contact. An individual may contact at the midfoot and than rock backwards onto the heel or not touch the heel down at all. An example of this gait pattern would occur in a sprinter. Following an understanding of the basic phases of gait, one can proceed to recognizing the motions that occur in the structures of the lower extremity and understand the interrelationships of these structures. This image summarizes the stance and swing phases of gait and the interrelationships between both limbs. The period of double support, during which both feet are on the ground, occurs during 2 time periods in the stance phase. Double support occurs during the initial and final 20% of the stance phase. The terminal double support phase has implications for the final portion of stance phase - the propulsion phase. The propulsive phase may be divided in to an active and passive phase. The active portion occurs after heel off and before the opposite foot touches down and terminal double support begins. The passive portion of terminal double support begins with the touchdown of the opposite foot. During this passive portion, the foot rapidly unloads. Some people call this subphase pre-swing phase. We will next discuss transverse plane rotations occurring in the limb. At heel contact the pelvis is in slight external rotation. Slightly after heel contact, as the foot is adapting to the ground the pelvis rotates internally, than just before toe-off it rotates externally, where it remains during the swing phase. During running, if a runner swings his arms across his body, there is a compensatory increase in pelvic rotation. It is more efficient and better for the pelvis and pelvic musculature if the runner moves his arms parallel to the motion in which he is running. Femoral rotation within the hip joint correlates precisely with pelvic rotation. At heel contact the femor is in a neutral position and then rotates internally. It moves back to external rotation before toe-off and remains externally rotated until heel contact. The tibia internally rotates more rapidly than the femur. This assists the unlocking of the knee joint, by assisting in the unscrewing of the knee. Excessive internal rotation may be related to abnormal pronation of the foot. This has implications for abnormal limb and knee function. An important muscle function during the contact phase and midstance phase is that of the posterior tibial muscle. It is often thought of as a supinator of the STJ. It also functions to slow up the internal rotation of the tibia by having an action on the leg. When the STJ supinates during what is called closed kinetic chain the tibia externally rotates. The posterior tibial muscle can effect this action on the tibia, particularly when it is firing as the foot is pronating, the action is referred to the tibia, which slows its internal rotation. Keep this function in mind as we proceed to discuss the STJ and Closed kinetic chain. The key to the relationship of abnormal foot function to lower extremity biomechanical abnormalities is the Sub-talar Joint. The bones that comprise the subtalar joint are the talus and calcaneus. Motion at the sub-talar joint is a complex triplanar, mutiphasic action. The motion that occurs at this joint is called supination and pronation. A normal subtalar joint is a critical component of normal foot function. The normal range of motion of the subtalar joint is approximately 30 degrees. 2/3 of this motion is normally inversion and 1/3 is eversion from its neutral position. Neutral Position is calculated by adding 33% of the total motion available to the everted position of the joint or determined by palpation. Motion at this joint is measured by movement of the calcaneus. The neutral position is ideally located parallel to the long axis of the leg. In many cases in which there is abnormality of the foot, the neutral position is in a varus relation to the leg. The key to the relationship of abnormal foot function to lower extremity biomechanical abnormalities is the Subtalar Joint. The bones that comprise the subtalar joint are the talus and calcaneus. Motion at the sub-talar joint is a complex triplanar, mutiphasic action. The motion that occurs at this joint is called supination and pronation. A normal subtalar joint is a critical component of normal foot function. The normal range of motion of the subtalar joint is approximately 30 degrees. 2/3 of this motion is normally inversion and 1/3 is eversion from its neutral position. Neutral Position is calculated by adding 33% of the total motion available to the everted position of the joint or determined by palpation. Motion at this joint is measured by movement of the calcaneus. The neutral position is ideally located parallel to the long axis of the leg. In many cases in which there is abnormality of the foot, the neutral position is in a varus relation to the leg. If there is a lack of normal motion at the sub-talar joint, either excess motion or insufficient motion, abnormal stresses will be placed on the foot, ankle and leg. Deviation of the axis from the transverse plane affects the motion of the foot. With a high axis there is much abduction and adduction of the foot. When the axis is low there is a greater amount of inversion and eversion of the foot. Supination about the subtalar joint axis involves the calcaneus adducting, inverting and plantarflexing. There is a concommitant external rotation of the tibia. Factors that occur in the foot, such as a forefoot valgus or pes cavus, in which there is an eversion of the forefoot, will cause the tibia to externally rotate. Factors that occur in the limb that externally rotate the tibia, will cause a concommitant supination about the subtalar joint axis. If you observe and consider the motions of the limb and foot during a golf swing or when swinging a bat, these interrelated motions are readily observed. Pronation is the opposite of supination and involves the calcaneus everting, abducting and dorsiflexion. This may occur for a variety of reasons. The fact that the calcaneus dorsiflexes during this motion makes this motion a compensatory motion for an equinous. (Which is a tight achilles tendon, or gastroc-soleus complex). An equinous has been defined in a variety of ways. It is best defined as existing when the foot can not dorsiflex on the leg more than 10 degrees. The reason why problems in the foot can affect the rest of the extremity is explained by the principle of the closed kinetic chain. The closed kinetic chain begins with the foot and encompasses the entire lower extremity. It requires the foot to be in contact with the ground. When the foot is on the ground, any motion occurring in one portion of the limb affects all other parts. A rotation inward of the tibia will cause the foot to pronate about the subtalar joint. Likewise a pronatory motion of the foot will cause the tibia, femur and the entire leg to follow it and rotate inward. With supination the tibia and limb will rotate externally. Following this brief review of normal gait, we will review normal foot biomechanics before proceeding to abnormal variation of the foot which may cause dysfunction and symptoms. One of the primary determinants of normal gait is adequate dorsiflexion at the ankle. As previously mentioned, in order for normal gait to occur, there should be at least 10 degrees of dorsiflexion available. This is necessary, because, during the mid-stance phase of gait, while the leg moves over the foot, if there is an equinous there will be an early heel off. Pronatory forces will be created, because pronation is a conpensatory motion for equinous. It is compensatory because: when the foot pronates, one of the three components of pronation is dorsiflexion (at the calcaneus). The other 2 components to remember are abduction and eversion of the calcaneus. A normal foot should have the front part of the foot perpendicular to the heel as visualized by bisecting the calcaneus. The heel bisection should be parallel to the leg, and this line should also be essentially perpendicular to the ground. A forefoot varus exists when the forefoot is inverted to the rearfoot. A forefoot valgus exists when the forefoot or first metatarsal is everted to a bisection of the calcaneus. This occurs in a cavus foot type. The midtarsal joint is composed of 2 separate joints. The first is the calcaneo-cuboid joint, the second is the talo-navicular joint. These two joints function together as a single unit and are then called the midtarsal joint . The MTJ is usually described as having 2 axes. These are the longitudinal axis and the oblique midtarsal joint axis. Both pass obliquely through the foot in an anterior, medial and dorsal direction. The average longitudinal axis is 15 degrees from the transverse plane and 9 degrees from the sagittal plane. The oblique axis averages 52 degrees from the transverse plane and 57 degrees from the sagittal plane. Since both of these axes pass through all 3 body planes, their motion is that of supination - pronation. The longitudinal axis allows mainly inversion and eversion of the forefoot to occur, while the oblique axis allows substantial adduction-abduction and plantarflexion-dorsiflexion of the forefoot to occur. There is an increase in motion at the MTJ available when the STJ is pronated. This is explained by the locking and unlocking mechanism of the MTJ. When the STJ is pronated the axis of the Calcaneo-cuboid joint is parallel to the axis of the talo-navicular joint and free motion occurs. When the foot is supinated the axes are divergent and the motion is more restricted. Force flow through the foot may be measured today by a variety of means. The Electrodynogram was the first system available for office use and consisted of 7 sensors applied in standard positions on the foot. Other technology accomplishing this exists today. This technology this gives us the advantage to observe forces beneath the foot which we can not visually see. It also measures the timing of the phases and subphases of gait that we have reviewed and greatly increases our knowledge of what is occurring during the gait cycle. Normal pressure flow through the foot starts slightly lateral in the heel and flows forward to between the first and second metarsal and exits throught the great toe. A situation which would cause a shift lateral will occur when the first ray is hypermobile and not bearing its normal amount of weight. Extreme lateral shift will occur when there is a forefoot varus which cannot be completely compensated for at the subtalar joint (STJ) or the midtarsal joint (MTJ). The normal calcaneus is vertical to the ground and its bisection is parallel to the long axis of the leg. The obviously pronated foot will have a calcaneus which is everted, but not every pronated foot may be detected by observing an everted calcaneus. It is important to note that a foot may have a vertical calcaneus and still be functioning maximally pronated. If the extreme limit of eversion of the subtalar joint only brings the calcaneus to a 0 degree eversion relationship with the leg, the STJ will be maximally pronated at this position of 0 degrees of eversion. Most pronated feet, however will give the appearance of a flat foot with a turned out, or everted heel, low to the ground. The foot is normally pronated at the end of contact phase, but should be fully re-supinated before toe-off. If the foot remains pronated, abnormal stresses and angular relationships will exist through out the limb. Changes will also occur in the weight distribution pattern of the foot with more weight being transferred medially. This may be seen using any of the computerized gait analysis systems available, the effects may be observed in abnormal callus formation below the second metatarsal and great toe or inferred just from knowledge of toot function. We will now turn to the static examination of the lower extremity. When examining the lower extremity, the more information we obtain before making a conclusion, the safer we will be if our initial assumptions turn out to be incorrect, or if our mechanical therapy has not been adequate. An examination with the patient initially supine can quickly obtain the range of motion of the femur to determine whether adequate motion is available at the hip joint, and to calculate the neutral position. This may be measured in a variety of postions, seated-knees straight, seated-knees flexed, and so on to determine which muscles may be or are restricting motion. Other aspects of the static nonweight-bearing examination include determination of ankle motion, subtalar joint neutral and available motion, forefoot to rearfoot position, malleolar position, and general flexibility of hamstrings, calf muscles and hip flexors. At a speed of approximately 5.6 miles per hour there is usually a transission to running gait which becomes more efficient at that speed. The cost of running is measured in ml-O2/kg/min or in O2 comsumption of which the MVO2 is of interest to performance runners. O2 consumption as a function of speed increases in a linear manner up to the point of VO2Max. The optimal cost of running (transport) is usually at a minimum in the middle of the speed range for a specific gait type whether it be walking, running or for a horse a trot or a gallop. Both animals and people usually select the most efficient speed. With a faster stride frequency the theory holds that the muscles must generate force over a shorter period of time which requires more energy. This equation applies cross-species and to over a 4000 magnitude range in body size. It is used over a range of speeds and for both quadrupedal and bipedal locomotion. With the faster stride frequency metabolic activity is heightened and cross bridges are being formed and broken more rapidly. This occurs with an increase in the rate of calcium transport via the calcium pumping mechanism. This all occurs during the contraction phase of muscles. Potential energy is being stored during the "stretch" of a muscle. It is readily seen that the Achilles tendon is one of the best areas for storage of potential energy, although the hip flexors certainly play a major role in bringing the limb forward (after reaching maximum stretch) for the next step. Just before toe-off and the beginning of the swing phase of gait, both the calf muscles and the hip flexors appear to be at the peak of their potential energy and ready for action. SE = ½ (stress2/E) . Strain Energy is measured in Joules/meter3 . The resilience of a material, in this case a tendon, is defined as the amount of energy that can be absorbed by the material without causing a permanent deformation or damage to the material. Thus some of the work done by the muscle when contracting, is actually done by the stored energy in the tendon, in which stored energy is returned to the locomoting system. Potential energy and kinetic energy are considered to be out of phase in walking and in phase in running. During the airborne phase energy is at a constant (with minimal air resistance), after contact the energy rapidly decreases, then potential energy is again stored as the body moves forward over the limbs and the hip and leg are in positions of tension. Diagram of energy in terrestrial locomotion by Patrick Willems at the Unit Laboratory of physiology and locomotion at Universite Catholique de Louvain in Belgium's site. Gait of different parameters (i.e. running, walking, etc.) has an optimal Froude number. Griffin (2003) indicated that whatever work that muscles do, the metabolic cost of walking is primarily a result of the cost of generating muscular force during the stance phase. Obviously it will be important to make the stance phase as efficient as possible. On the other hand Marsh et. al. (2004) take the converse approach that swinging the legs is an "expensive" proposition and consumes 26% of the energy needed by the limbs with the other 74% being used by the stance-phase muscles. Blood flow to hindlimb muscles in guinea fowl was measured (and not humans). Keep in mind that gait studies are usually pertinent across species and not species specific and that this study was an invasive procedure. Marsh mentions that other authors had felt that the swing phase cost was negligible. Perhaps this was due to the others not considerting humans and other animals with well developed thighs and the bioenergetics that are readily apparent in running for humans rather than in bird running where sophisticated experiments were needed to demonstrate the cost of the swing (and in humans the cost to reach the float phase of running). The Marsh study has employed a novel means to measure the cost of motion. When the patient is standing general symmetry should be observed. The shoulders and relative arm length should be noted. Pelvic tilt and the heights of the gluteal folds should be noted as an indicator of leg length inequality. The frontal plane of the tibia should be noted, as should genu valgum or varum. The angle of stance, calcaneal stance position, relaxed and neutral are also worth noting. In the gait examination, we will observe for symmetry. We will look for clues regarding leg length inequality. Arm swing asymmetry, uneven head bounce, unilateral pelvic drop, uneven stride length are all indicators that there is a leg length inequality. Other factors to note are: the heel contact point, an apparent bouncy gait (indicating equinous), excessive pronation of the foot, early heel off and the angle of gait. One also should note trunk position including lateral trunk bending, and anterior or posterior trunk bending, increased lumbar lordosis or circumduction. Evaluating any lower extemity problem begins with the usual history of chief complaint. The onset, duration, and characterization of the complaint are important to note. The method and approach to good history taking will not be reviewed. When approaching the patient with a foot problem, as with any other problem, it is important to be weighing the possibilities as you are taking the history. Two of the most important clues with foot and leg pathology are: location of the chief complaint and type of onset. The location will pin down what structrures are affected, and from knowing what structures are affected, the possibilities will be narrowed. Most body parts are best approached first by looking, then touching and then by moving. It is best to approach posssibly related structures, before touching the actual point of presumed maximum tenderness. The British Orthopedist Apley has well described this approach. Observation is performed from behind, side or the front. Running gait needs to be looked at in depth and we will revisit this. Running is a one legged exercise. Looking at one leg only, one sees a stance phase and a swing phase as in walking. But in reality, one must look at both legs and one then finds a three phases including a "float phase". Therefore, the phases of running include a stance phase, a swing phase, and a float phase . You are only in contact with the ground with no more than one limb throughout the running gait cycle and a portion of the gait cycle has no limb in contact with the ground. Shortly we'll return with more comprehensive overview of running gait. At this time we'll take a quick look at one of the key muscle groups functioning during the running gait and recent research on this group which is the Hamstrings. Other pages detail information on hamstring pulls and hamstring injury. In the sprinting gait, the eccentric contraction in the latter phases of open chain gait is a likely factor in the injury of this muscle group. Recent publications support this theory (Bing et. al. 2008). The hamstring muscles generated the largest forces during the early stance phase and the late swing phase. During the late swing phase the forces were two to three times greater than during the late stance phase and the early swing phase. Although both the late stance and early swing phases have increased forces and strain potential, the two phases of gait during which injury may occur might predispose to different injury locations. Bing et. al. (2008) noted that in previous studies such as Best et al. (1995) demonstrated that strain injury occurred at the muscle–tendon junction when the strain rate was low while occurring at the the distal muscle belly in cases of high strain rate. was high. Bing et. al. (2008) demonstrated that that the hamstring muscle elongation velocity was significantly higher during the late stance phase than during the late swing phase. Their conclusion was that in combination with Best et al. (1995) was that a strain injury may be more likely to occur "at the hamstring muscle–tendon junction during the late stance phase than during the late swing phase while it may be more likely to occur at the muscle belly during the late swing phase than during the late stance phase." Best, T.M., McElhaney, J.H., Garrett Jr, W.E.. and Myers, B.S. . Axial strain measurements in skeletal muscle at various strain rates, Journal of Biomechanical Engineering 117 (1995), pp. 262–265. Bing Yu, Robin M. Queen, Alicia N. Abbey, Yu Liu, Claude T. Moorman, William E. Garrett, Hamstring muscle kinematics and activation during overground sprinting, Journal of Biomechanics, Volume 41, Issue 15, 14 November 2008, Pages 3121-3126, ISSN 0021-9290, DOI: 10.1016/j.jbiomech.2008.09.005. Kannus P, Niittymaki S. Which factors predict outcome in the nonoperative treatment of patellofemoral pain syndrome? A prospective follow-up study. Med Sci Sports Exerc 1994;26:289-96. Koh TJ, Grabiner MD, De Swart RJ. In vivo tracking of the human patella. J Biomech 1992;25:637-43. Kramer PJ: Patellar malalignment syndrome: Rationale to reduce excessive lateral pressure. J Orthop Sports Phys Ther 8:301-309, 1986. Thelen, D; Chumanov, E; Hoerth, D.; Best, T.; Swanson, S.; LI,L; Young, .M; Heiderscheit, B." Hamstring Muscle Kinematics during Treadmill Sprinting". Medicine & Science in Sports & Exercise. 37(1):108-114, January 2005.